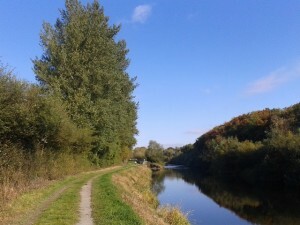 In Ireland only two Poplars are considered native – although other species have been introduced as ornamental trees or for timber, shelter-belt or screening. Black poplar – Populus nigra – although there is some doubt about this one. 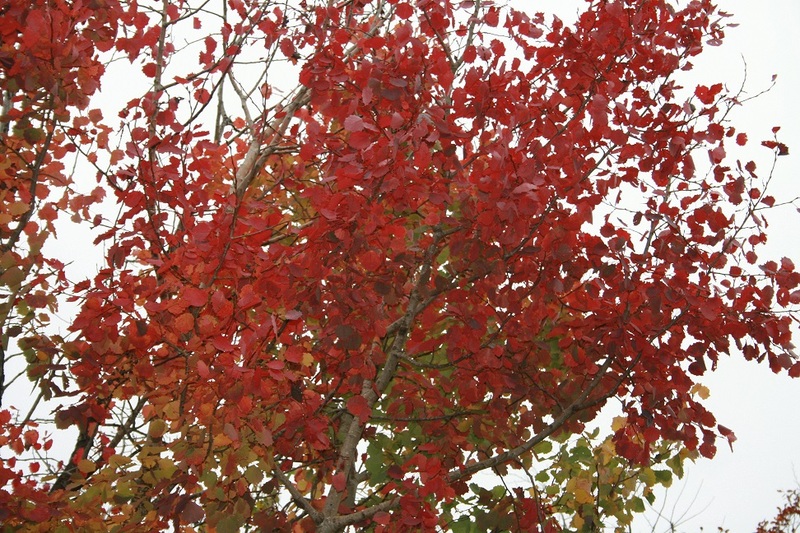 Note the broadly toothed or wavy leaf margins which distinguish it from the related American species Populus tremuloides or Quaking aspen. 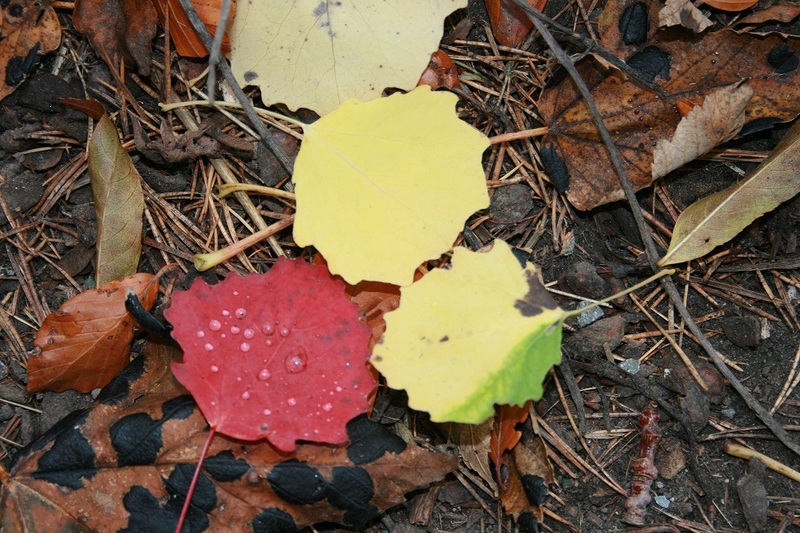 Both of the aspen species have flattened petioles or leaf stems which makes the leaves flutter and clatter in every tiny breeze. Hence the names: tremula and tremuloides. Many hybrids of P. trichocarpa x black poplar and perhaps P. deltoides x black poplar which can be planted for fast growing timber or as short rotation coppice for biomass cropping. 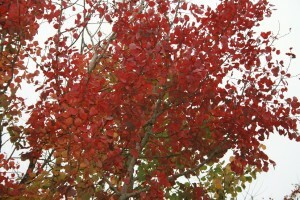 The white poplar P. alba is a native of Morocco and the Iberian peninsula and central Europe. 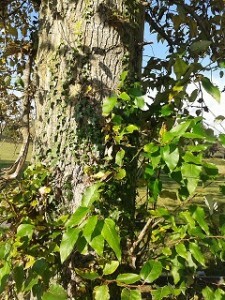 It is widely planted throughout Ireland and Britain as an ornamental having attractive leaves with white, felted undersides which flicker brilliantly when stirred by the wind. Again, it is possible the bees visit the catkins of these early in the year and gather a little pollen but it is not something I’ve ever seen personally. In addition is P. trichocarpa or Western Balsam Poplar which has been widely planted as a shelter-belt tree, or for screening, or as a fast growing timber tree. Such as this lovely row below on the river Barrow just below Milford near Carlow. I don’t know why they were planted (she added hastily) but they are in a line and they are lovely. Like all poplars these are thriving close to the river which does flood in the winter. In fact it floods in summer too. Not at all. At that time of the year, late March, just as the buds are breaking and the new leaves are unfurling – the scent of them is wonderful. It is this smell that gives them their name and any beekeeper getting a whiff of this will immediately recognise it as propolis. 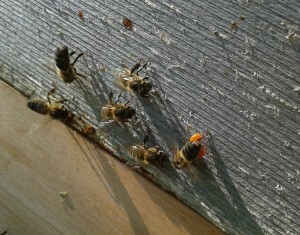 So would the bees who most certainly visit for the propolis and perhaps the catkins too. These (above) are the late-summer leaves of the Balsam poplar. The slightly serrated leaf-edges distinguish P. trichocarpa from the closely related P. deltoides and hybrids. When the leaves are freshly opened in spring they have a slightly wet look, are sticky to the touch and strongly propolis scented. 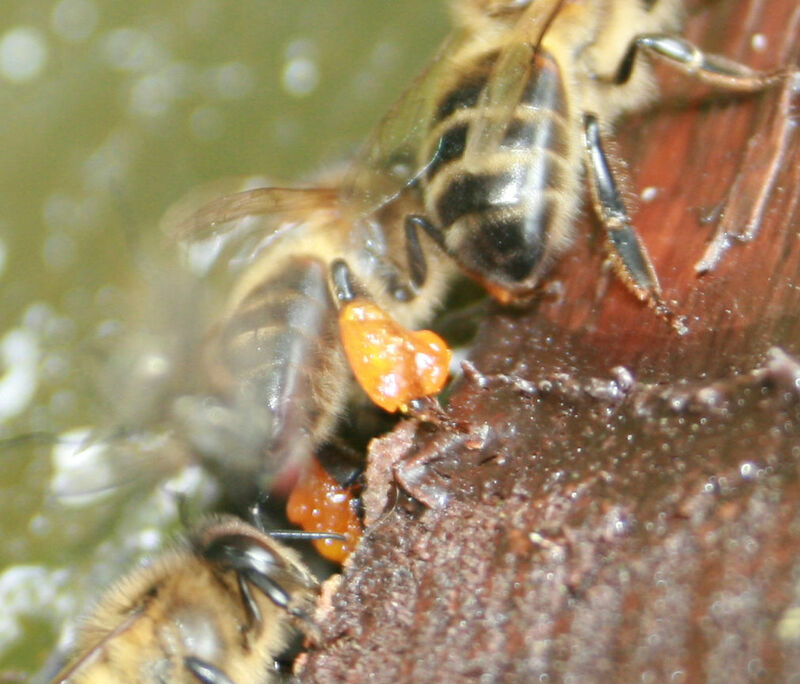 In addition to the propolis and the possible catkin-pollen, poplars have a further possible value to the bees Melampsora rust spores. 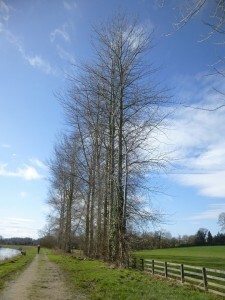 Poplars are susceptible to a genera of rust fungi called Melampsora. These fungi invade the leaves of poplars causing blisters or pustules which eventually rupture to release the powdery orange spores which no doubt have given rise to the common name of ‘rust’. Honey bees will gather the spores of Melampsora rusts in times when pollen sources may be scarce. 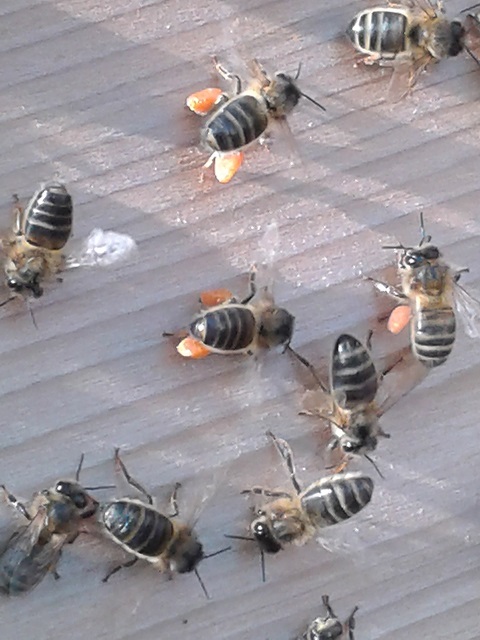 This year I saw my bees bringing in large quantities of bright tangerine orange pollen – or what I thought to be pollen but when I tried to identify it the only thing that was anything like that colour in the pollen guide (and from Mr. Google of course) was Melampsora rust spores. This is what they looked like but the photos don’t do justice to the vivid orange colour of the spores. An unfortunate consequence for the trees is that the bees are helping to vector the disease. 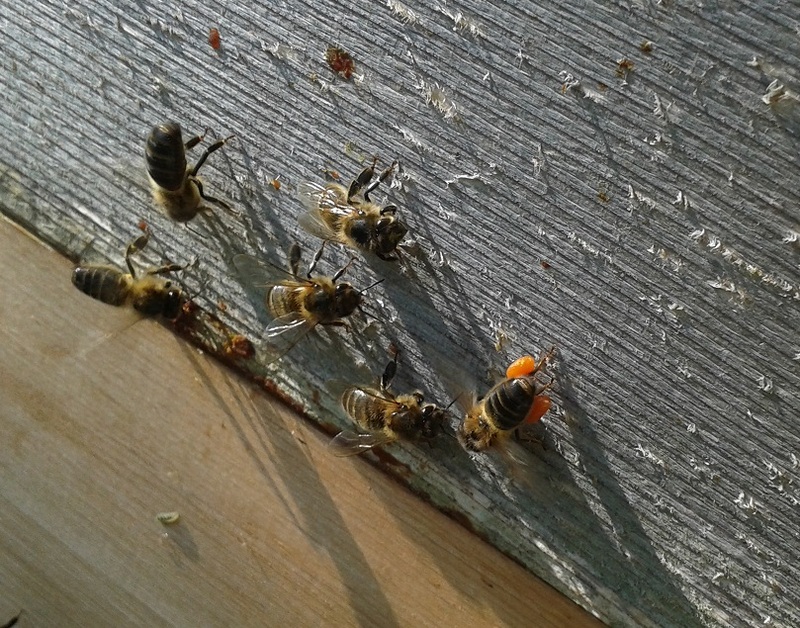 So that’s three things the bees get from Poplars – a little pollen, propolis and an emergency pollen substitute. Poplars are fast growing so the timber tends to be on the light side. It is used nowadays for paper pulp, joinery, veneers and plywood. In the past it was used in carts and floorboards and also in a Medieval architectural technique known as cruck building where pairs of massive curved beams were upended and joined to form a roof which was then thatched. Here’s an interesting one: because the wood is odourless it is considered ‘food safe’ and is much used in France to make those lovely cheese boxes Camembert comes in. It is also used to make fruit boxes. This is why you see so many groves of poplars growing in France – much bedecked with mistletoe. Still in France – apparently when a landowner has a daughter he plants a grove of poplars. The reason being that by the time she is ready to marry, the poplars will be ready to be felled (fast growing you see!) and the price the farmer gets for the timber is used for the dowry. You learn something new every day – or so they say. Poplar wood is not much use as firewood because it spits but it can be grown in short rotation coppice and chipped for use in wood burning electricity generators or made into pellets for pellet burning boilers.